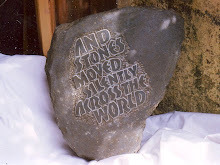 This is to let you know that I am now in full flow preparing to take stone number 3 in the migrating stones series to Sydney, Australia. The current mountain that I'm preparing to climb is deciding which airline to fly with. Given that I'm going to be carrying a rather unusual object - and a heavy one at that - I need to be rather careful as the last thing I want is for the stone to be blown up when an unsuspecting baggage inspector looks at his or her screen and sees a large, unidentifiable thing in my suitcase. 3/ What paperwork do I need to ensure that the stone can successfully make its flight from Heathrow to Sydney in September. With regard to question one, I spent most of yesterday inspecting roasting trays. Yes, that's right, roasting trays. The latest brain wave led me to believe that two taped together would be the most efficient and economical protection for my stone. Later, when I thought about this, the pitfalls were obvious. Strange object surrounded by foam in between two taped together roasting trays. The only other thing i'd need to add would be a clock and a bit of wiring. Thankfully Sam, my man, came to my rescue with a black box that will serve the intended purpose perfectly.